and knitted the fourth sock of 2011. 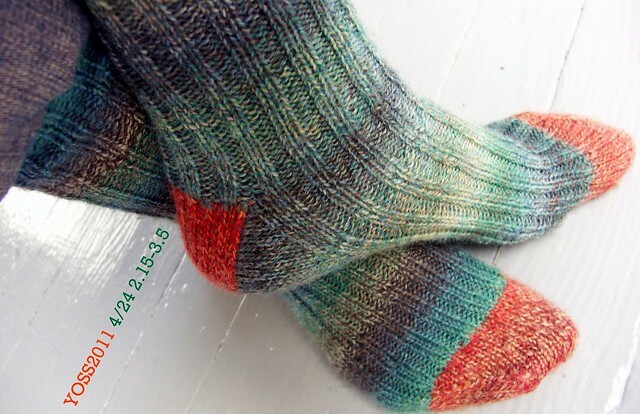 Support me as I take the Year Of Stash Sock 2011 challenge by following my year-long sock knitting spree for a chance to win a pair of hand-knit socks. To enter the giveaway, simply comment with a personal highlight occurring during the two week period featured in this post. BONUS: Comment on ALL 24 bi-monthly YOSS2011 updates and double your chances to win! See the giveaway rules for more info. Subscribe to the YOSS2011 RSS feed. Share a personal highlight from the second half of February, for a chance to win a pair of hand-knit socks!